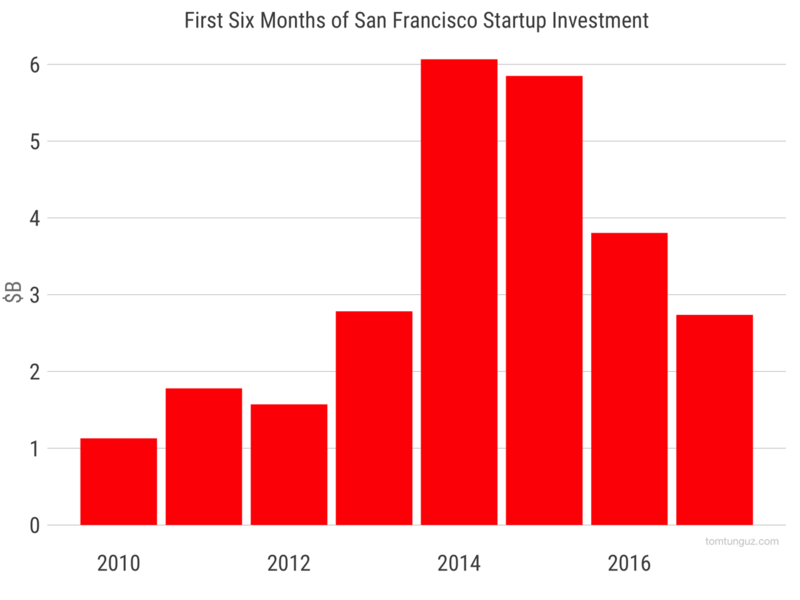 If we plot San Francisco startup fundraising activity through the first six months of the year, rounds A through D, beginning in 2010, we see the surge during the 2014-2015 heyday and then a reversion to an elevated mean in 2016 and 2017. Note, the levels still exceed 2010-2013. But the 50% decline is real. Series As and Bs certainly have declined to some extent, falling about 50% each. But the real drivers in the fall of San Francisco’s overall numbers are the 66% and 75% falls of Series C and Series D.
There could be two explanations for this fall. The first is investors in those rounds have pulled out of the market. The second is that the wave of companies born in the early 2010s that needed to raise large Cs and Ds have already done so. I think the reality is a combination of both. The market is cyclical for both investors and founders. But if we look at the total amount of money raised by Valley companies, which I’ve defined as SF Bay Area companies not headquartered in San Francisco, 2017 shows a 50% jump in the first six months compared to 2014-2016. That’s a reversal from San Francisco, and the industry broadly. 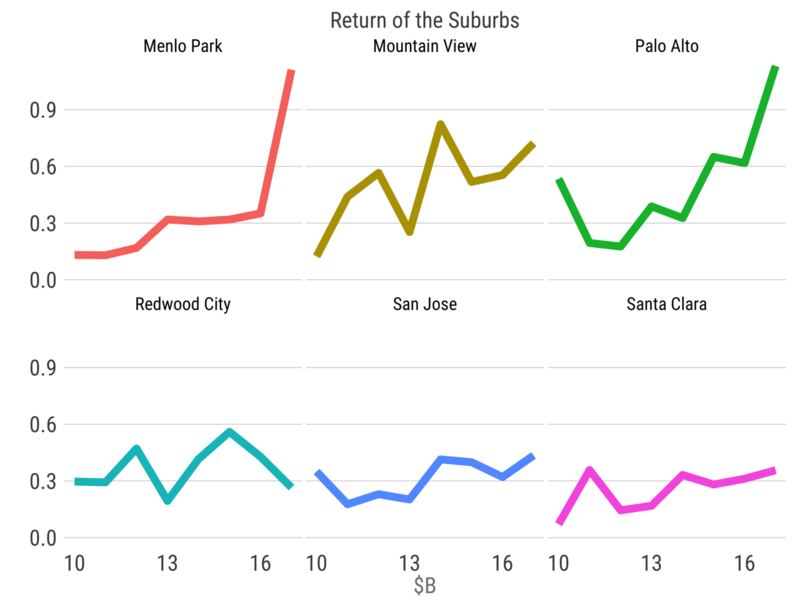 If we compare San Francisco to the Valley by round, Series Bs and Series Ds have increased markedly in the valley in 2017. Series As and Cs are roughly similar. 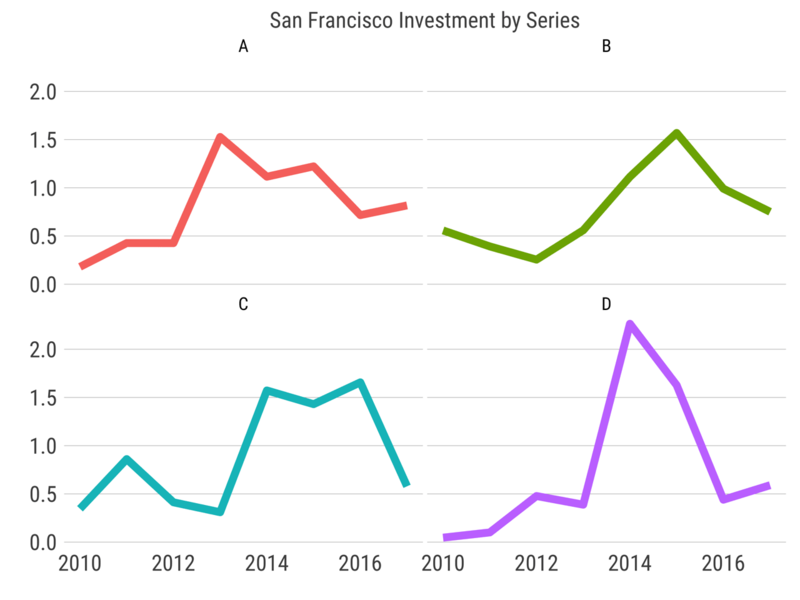 Because of the varying behavior of Series C and D investors across geographies, (invest less in San Francisco but invest more in the valley), I can’t argue that late stage investors have pulled out of the market broadly. The startups raising hundreds of millions or billions might bias the data, I thought. But removing Uber, AirBnB and their ilk doesn’t change these trends materially. Might a consumer/enterprise regional hypothesis work? More consumer companies in San Francisco. More enterprise businesses in the valley. The data doesn’t support that hypothesis. E.g., Twilio and Github in San Francisco. Essential and Robinhood in the valley. In the valley, Menlo Park and Palo Alto are benefitting from record fundraising periods. GRAIL raised $900M earlier this year in their Series B, which provides most of the gain for Menlo Park. Palo Alto is more distributed across Essential, Rubrik, Robinhood and many others. 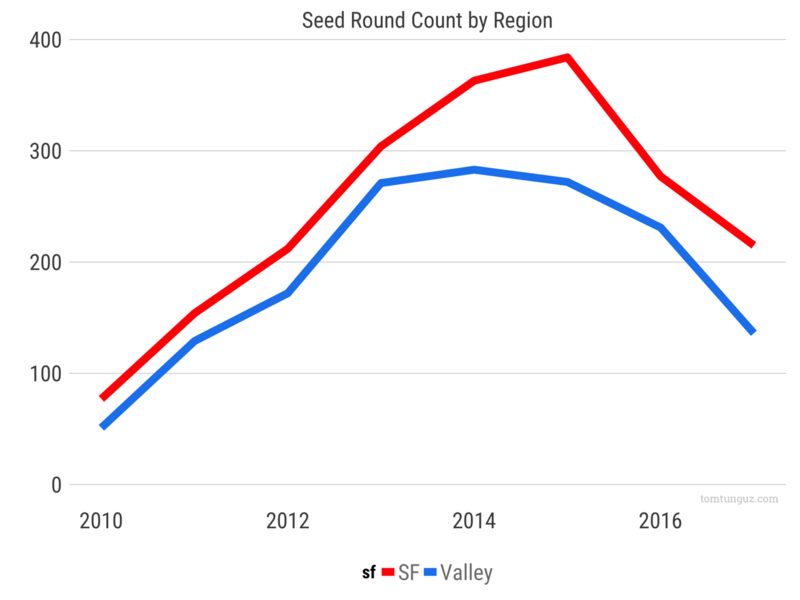 If we examine seed round activity, the data shows the number of seed rounds across these two regions is highly correlated. San Francisco may have reached a higher peak, but that trend is transient. We have ruled out investors pulling out of the market broadly, a sector rotation from consumer into enterprise, and differences in regional company formation as causes. 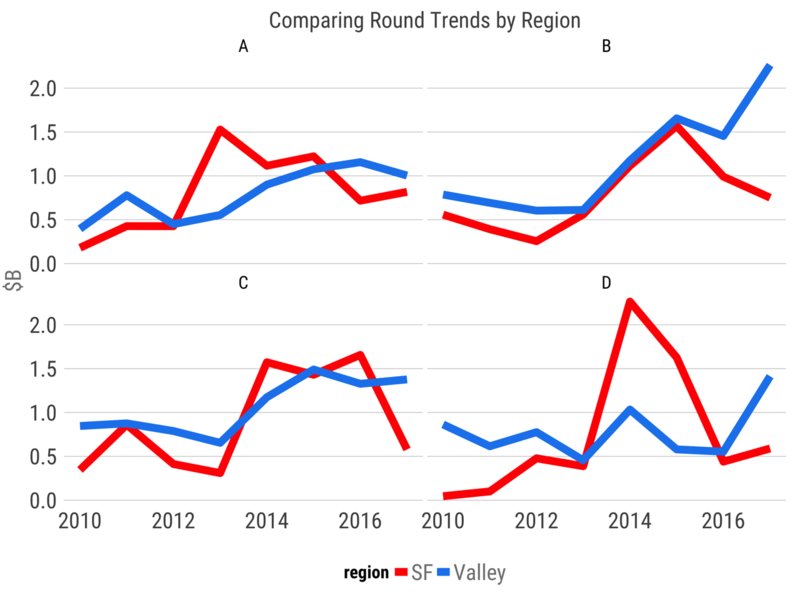 Other analyses we could run would be the correlation of fundraising with real estate prices, average round sizes by round and city, the impact of VCs starting offices in San Francisco, but I suspect none of those matter. Ultimately, I don’t believe there’s any real driver for a reduction in San Francisco startup fundraising activity that’s meaningful or important. 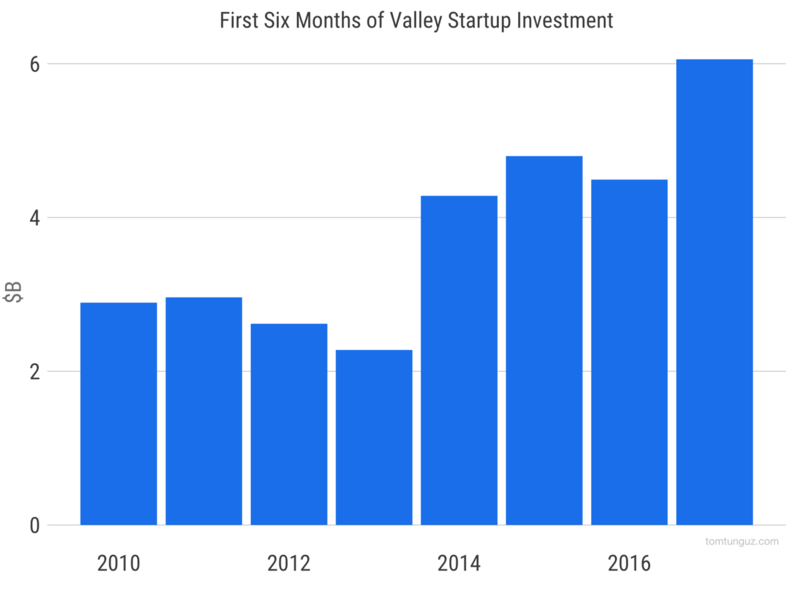 It’s just so happens that startups in the valley are having a strong six months while San Francisco startups are raising less. The data shows those San Francisco companies have raised plenty in the past few years. Now it’s the Valley startups’ turn to raise. And some of these rounds are sufficiently large to meaningfully change the numbers. A billion here and a billion there certainly changes the complexion of the charts. But this volatility suggests a trend that isn’t supported by a broader cause.